The Celts perceived the presence of divine forces in all aspects of nature. Patterns of harmony and balance, of dark and light, winter and summer, female and male, are woven throughout Celtic tradition. 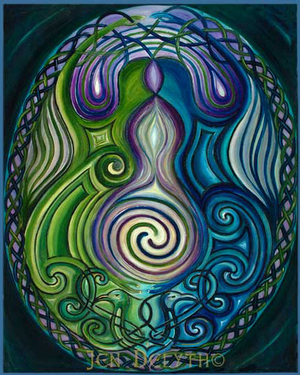 The waxing and waning moon is archetypal symbol representing re-birth, healing and creativity (female). The illuminating sun is life-giver, the light of the world (male). This design is inspired by the most profound of life’s mysteries, that of the birth of a new life from the union of male and female, yin and yang. This is both a literal primal act of love and procreation, and an alchemy within the psyche or soul self. The psyche contains elements of both archtypalanimus (solar male) and anima (lunar female) qualities. In working towards balance and fulfillment of both our solar and lunar energies, the self emerges more fully realized, giving birth to the divine within. Within Celtic mythology, birds are symbols of the spirit, and carry the soul to and from the Otherworld, at birth and death. Through initiatory experiences along our life journey, we often experience death and rebirth of the ego. As our renewed self emerges, our creativity and inner light shines ever more brightly.